• Detangles and nourishes your hair, making it ready for the summer season. This formula helps protect the hair against damage and summer frizz**, making it soft and smooth. 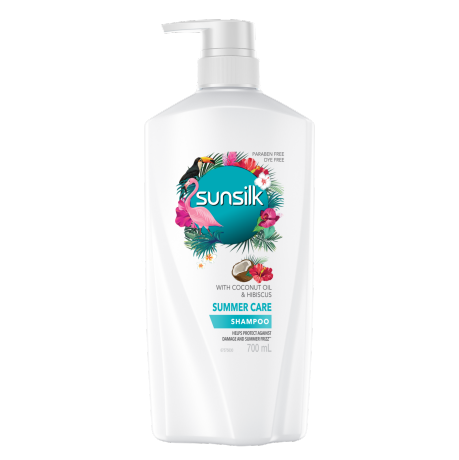 **Sunsilk Summer Care Shampoo & Conditioner vs. non-conditioning shampoo. Ready? Use after every shampoo. Gently massage through to the ends of your hair, then rinse thoroughly. For even more incredible hair, why not combine it with Sunsilk Summer Care Shampoo? Water, Cetearyl Alcohol, Dimethicone, Stearamidopopyl Dimethylamine, Behentrimonium Chloride, D-Glucanolactone, Trehalose, Sodium Sulfate, Hibiscus Sabdariffa (Hibiscus)Flower Extract, Ethylhexyl Methoxycinnamate, Amodimethicone, PEG-7 Propylheptyl Ether, Cetrimonium Chloride, Dipropylene Glycol, Lactic Acid, Sodium Chloride, Disodium EDTA, Methylchloroisothiazolinone, Methylisothiazolinone, Phenoxyethanol, Glucose, Propylene Glycol, Fragrance, Benzyl Salicylate, Butylphenyl Methylpropional, Hexyl Cinnamal, Limonene, Linalool.